I've been asked by a member on a French forum if I could help him to make his Thunder Force AC conversion to work. I had never worked on the System C2 before so I was a bit curious to discover it. The member had used the bootleg ROMs for his conversion and experienced colour issues. I preferred to base my work on the original ROMs. 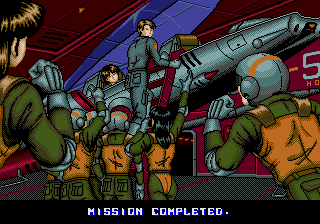 I ran my conversion in MAME and the game would just start normally but then hung at the beginning of stage 1. In fact on this hardware protection is very weak and I quickly found how to patch the game: I reassembled the IC31 & IC32 ROMs together (interleaved odd & even bytes) and modified a jump conditioned by the result sent by the protection chip. At the end I only had to modify a single byte. I thought it could be interesting to explain the method I used. I first ran the original game in MAME (romset tfrceac) so as my "conversion" forcing MAME to use a different protection chip (in this case I used the one of Zunzunkyou No Yabou, romset zunkyou). I use the MAME debugger (e.g. mame -window -debug tfrceac) allowing me to view code execution, place break points, do step by step execution, etc. Which means a byte is tested and if result is equal game jumps to 0x4144 if not it continues to the next instruction which is a relative jump of +0x656 corresponding to address 0x4798. P.S. : Files IC31 and IC32 have to be interleaved in order to work on the code. One contains odd bytes (LSB) and the other one even bytes (MSB). Once the modification made the file has to be de-interleaved into 2 files. It's been reported that the hack contained a bug where you never lose lives. That was right, there's an other protection @ 0x27C2. I've patched it too and updated the files. Thanks. 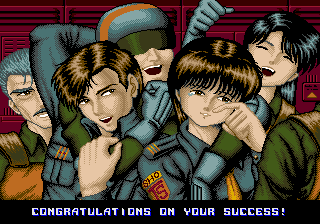 I've patched all the System C2 games and even hacked Twin Squash to be played with a standard joystick. I burned your patched rom set and the game boots well, but the ship never dies, it plays for ever. have you encountered this as well? Check your dipswitches. One is invulnerability. Are you sure that it's controlled by DIP switches? Humm... Maybe not. I don't own the hardware, patch has been tested for real by different persons but none reported this bug. Thanks for your feedback, I had a look and find an other protection @ 0x27C2. This is now corrected and files have been updated. Awesome work Apocalypse, it works perfect now!!!! What do you use to de-interleave the files? Home made tool with other useful options (simulate stuck bit, byte swap, word wap, etc.). I made it using Visual Studio. Awesome work. 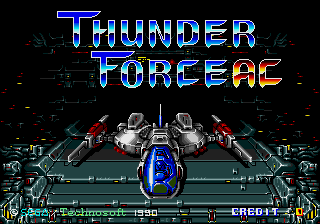 So can I get any system C2 board and use your roms to convert it to Thunderforce AC? The game started normally but it will be fixed with FREE PLAY MODE. Also, is the patch of Zunzunkyou No Yabou released? Not sure what you mean, the last version I made has been fully tested and reported as working perfectly by several persons. Maybe you should check your dipswitches. I did hack Zunzunkyou too and all the other System C2 games but never released them as I don't own the hardware to test my work. Can Bloxeed be used for TFAC? It's on c2 hardware but there's no eprom or socket where 13655 goes. I read on MJMoffit's site that there's no protection for Bloxeed so if I add a socket and the eprom do you think it'll work on this board? Bloxeed, Columns and Columns II are System C hardware not C2 thus they lack the audio µP chip. But that's not a problem to use a System C2 board, audio chip is just unused. There are also jumpers to set EPROMs size you might have to move.